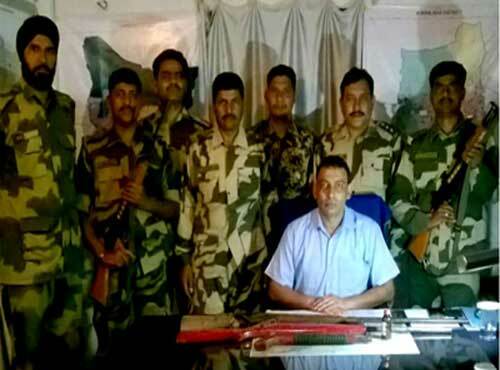 Border Security Force ( BSF ) troops of Guwahati Frontier, deployed in Dhubri, today afternoon, in a joint ops with Kokrajhar police recovered three country made guns, from Tipkai forest area. On a specific information own intelligence wing, Sector HQ Dhubri, about cached weapons in the forest area of Sishtyjhora, near police out post Tipkai under PS-Bogribari, Distt Kokrajhar, BSF troops led by Sh Ajay Pant, DC along with police rep of Tipkai OP launched a search ops in the area from 02:50 pm. After a thorough search of the area, for almost three hours, the ops party recovered three (03) country made guns, which were buried in the ground, deep inside the forest. These guns were seized and are being deposited with PS Bogribari. The recovery of these weapons on the day of first phase of Assam Assembly Elections in Upper Assam and Barak Valley and in the run up to the second phase, in Lower Assam, on 11th April is of significance. This successful ops has instilled a sense of security and safety in populace residing in the area.